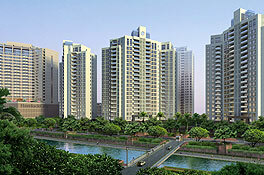 Havelock City is one of the biggest property development projects being constructed in the Wellawatte area of Colombo. Comprises of Shopping mall, cinema, Hotel & serviced apartments, Restaurants, Swimming pool, Gym etc. Mireka Capital Land (Pvt) Limited is the developer of Havelock City and is a joint venture between Overseas Realty (Ceylon) PLC (ORCPLC), the owner, developer and manager of the World Trade Center, Colombo and the Bank of Ceylon (BoC), the largest bank in Sri Lanka. ORCPLC owns 60% of Mireka while BoC owns the remaining 40%. 21/04/13 - Mireka Homes (Pvt) Ltd, which is building the apartments had completed the sale of phase 01, residential apartments and had pre-sold 50 percent of the 219 apartment twin tower second phase. The firm is expecting to finish construction of phase 01 by May 2014. The superstructure of tower C had reached level 11 and in tower D it had level 06 by end 2012, the firm said. The construction of a clubhouse with 55,000 square feet of recreational facilities, including a gymnasium, day care centre, swimming pools, Jacuzzi, badmington, basketball and squash courts, mini cinema, is expected to be finished by Augusts 2013. Phase 02 is made up for four towers with 600 apartments. The firm plans to begin construction and pre-selling of the third stage at the end of 2013 or beginning of 2014 based on the progress of the stage II. Havelock City is also expected to have the biggest shopping mall in Colombo.